Our bottles have had an upgrade! We are delighted to announce the launch of our brand new bottles for our entire range. 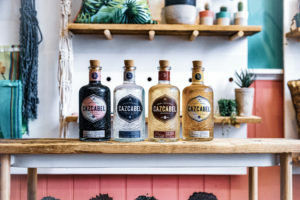 We’ve taken some elements of our core branding – the Mexican-inspired pattern from the Cazcabel label – and beautifully embossed it onto the glass of the bottles. To pay homage to the Mexican Curador that provided the inspiration for our range, each bottle now also carries Don Cazcabel’s signature of approval. The bottles now have a taller, thinner structure and an extended lip on the neck, so they’re easy for bartender use. It’s the same top-quality liquid with the perfect bottle to match. You’ll start seeing the new bottles appearing across the UK over the next 4-6 weeks. Buy Cazcabel at M&S now.